The cell. 3. Cell membrane. Permeability, fluidity. Atlas of plant and animal histology. Cell membrane functions are determined by their molecular composition. The type and proportion of these molecules will set the membrane physicochemical features: semipermeability, asymmetry, fluidity, repairing, and recycling. Membrane semipermeability is a consequence of the internal hydrophobic environment of membranes, created by the lipid fatty acid chains, which is difficult to be crossed by molecules having electric charges. Thus, by preventing free diffusion of molecules, membranes can form compartments that keep distinct internal and external environments. However, permeability is selective. Polarity and size are the more important molecular features that influence the ability to cross membranes. Small molecules without electric charges, such as CO2, N2, O2, and molecules with high solubility in fat such as ethanol, can cross membranes almost freely by passive diffusion (Figure 1). Permeability is lower for molecules that have electric charges when the number of positive charges equals negative charges, known as uncharged molecules, such as water and glycerol. It might be thought that water can cross membranes freely, but there are some restrictions, and that is why some membranes contain aquaporins, a type of transmembrane protein with a channel that allow the water cross freely. The ability of large uncharged molecules, such as glucose, to cross membranes is low. Membranes are highly impermeable to ions and charged molecules. Some values for the permeability coefficient by passive diffusion are: O2: 2.3 cm/s, CO2: 0,35 cm/s, H2O: 0,0034 cm/s, glycerol: 10 -6 cm/s, sodium and potassium: 10 -14 cm/s. Figure 1. 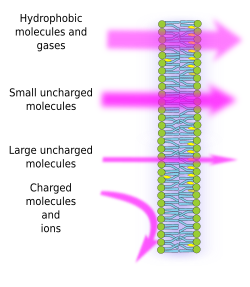 The size and electric features of molecules affect their ability to cross cell membranes (modified from Alberts et al., 2002). The unequal distribution of ions and molecules between both sides of a membrane makes it possible to generate and maintain electrochemical gradients. The difference between the inner and the outer concentration of electric charges is known as membrane potential. This gradient is used for many cell functions, such as ATP synthesis and transmission of information along the nerves. Semipermeability is also responsible for osmotic processes, which are water movements across membranes from a less concentrated solution in one side to a more concentrated solution in the other side, in order to equal both concentrations. In this way, plant cells are able to increase in size thanks to a higher intracellular concentration of some solutes that cause water to enter the cell, which in turn produces an inner hydrostatic pressure (called turgor pressure) that pushes cell walls outward. Molecules that do not cross membranes freely are useful for cells because they can create gradients that may work as information mechanisms or as energy stores. Cells have transmembrane proteins that allow to cross the the membrane or move charged molecules and ions between both sides of cell membranes, avoiding the inner membrane hydrophobic environment. For example, muscle contraction is triggered by the opening of channels that reduce an existing ionic gradient. Semipermeability is influenced by the lipid composition of membranes. For example, cholesterol content is important in the plasma membrane. An increase in the cholesterol content decreases fluidity and increase hydrophobicity, both features making membrane more impermeable. Thus, the increase of cholesterol over 30 % (which is a high value) makes myelin membranes very suitable for insulating the axons and optimizing the propagation of the action potential along the axon. Fluidity is a property of membranes. It is related to the ability of molecules to move inside the membranes. Higher fluidity means that movements are more frequent. Cell membranes are actually a sheet of fat, where molecules are in a semi liquid viscous state. Thus, it can be guessed that molecules can move by diffusion. 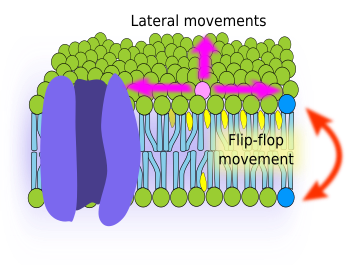 For example, a glycerophospholipid located in the external monolayer of the plasma membrane may have two type of movements: lateral, i.e., in the same monolayer, and flip-flop, i.e., jumping from one monolayer to the other (Figure 2). In artificial membranes, these two types of movements have been observed, being the lateral movements much more frequent than flip-flop. By lateral diffusion, lipids can travel 30 µm in 20 seconds; they can travel the whole circumference of a medium size cell in a minute. However, flip-flop movements are really infrequent because the hydrophilic head of the lipid molecule must cross the internal layer of fatty acid chains, and this is thermodynamically difficult. For one lipid molecule, the probability of a flip-flop shift is about one time per month. However, cholesterol behaves different and can do flip-flop quite easily. Figure 2. Membrane fludity allows lipid movement. Lateral movements are frequent, but flip-flop movements are rare for lipids and have not been observed for proteins. Membrane fluidity may change depending on the chemical composition. Generally, shorter fatty acid chains and higher amount of unsaturated bonds between carbons of fatty acids increase membrane fluidity. The amount of cholesterol also influences the membrane fluidity but the net effect depends on temperature and type of lipids in the membrane. Cholesterol has two effects: inhibits the transition to a solid gel state (less fluidity), but also decreases the flexibility of the unsaturated fatty acid chains. In general, it can be said that an increase in cholesterol concentration decreases membrane fluidity, although at low temperatures the effect is the opposite. Internal membranes of the cell, like those of the endoplasmic reticulum, contain very little cholesterol and therefore are more fluid. In addition, cholesterol provides membranes with other property known as hidrophobicity, which makes membranes more impermeable. Different molecular composition between the two monolayers of a membrane, known as membrane asymmetry, may generate a distinct fluidity in each monolayer. Depending on the molecular composition, lipids may be in two physical phases: liquid-ordered (less fluidity) and liquid-disordered (more fluidity). The outer monolayer of the plasma membrane is supposed to be more frequently in the liquid-ordered phase, whereas the inner monolayer is prone to be in liquid-disordered phase. Cells can modify the membranes fluidity by changing their chemical composition. For example, bacteria adjust the saturation and length of fatty acid chains so that membrane fluidity may be adapted to the environmental conditions. Variation in the glycerophospholipids concentration, such as phosphatidylethanolamine, may also modulate fluidity. Some insects cannot synthesize sterols, like cholesterol, and the sterols of their membranes come from food. They change the fluidity of their cell membranes by different concentrations of phosphatidylethanolamine. The inner membrane of mitochondria needs to be a strong impermeable barrier to create and maintain a proton gradient. It could be done by an increase in the cholesterol content. In this way the hidrophobicity is higher, but in turns cholesterol decreases fluidity, which appears to be very important for the function of proteins in this membrane. Mitochondria solve the problem with cardiolipin, an unsaturated phospholipid that increases hidrophobicity, but does not reduce much the membrane fluidity. Because of fluidity, it can be thought that proteins are randomly distributed and, therefore, membranes are homogeneous regarding the molecular composition, i.e., they show the same molecular content and proportion independently of the membrane region. This is not true. There are restrictions to the lateral diffusion of molecules that causes membrane heterogeneity, which means that there are regions of a membrane with different molecular composition. In non polarized cells, and at scales larger than 200 nm, plasma membrane looks like homogeneous, but at scales below 200 nm it is heterogeneous. The microdomains of membranes are thought to be around 60 µm in size. Lipids and proteins show lateral movements mostly restricted to 60-200 nm areas during a few milliseconds, and then jump to another adjoining area where they remain there for another short time. This behavior is called saltatory diffusion. 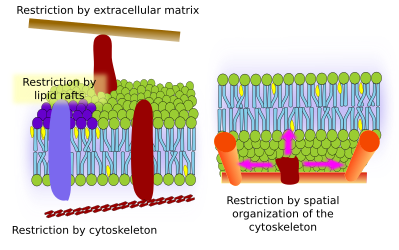 Restrictions to lateral movements of molecules may be caused by several mechanisms: interactions with the cytoskeleton or extracellular matrix, interactions of membrane molecules between each other, different densities of local membrane areas (changes in fluidity), amount of electrical charges, membrane curvature, and different thickness of membrane domains (Figure 3). Figura 3. Model of the plasma membrane showing the molecular interactions that restrict lateral movements and generate microdomains. Interactions of membrane molecules between each other constrain lateral movement. Both, proteins and lipids movements are influenced by these interactions leading to the formation of microdomains with differential molecular composition (Figure 4). The result is lateral heterogeneous distribution of molecules in membranes. Depending on molecular proportions, lipid microdomains may have different density (i.e. fluidity): solid, liquid ordered and liquid disordered. The most common density is liquid disordered, which is the most fluid. Figure 4. Interactions between lipids, mostly sphingolipids and cholesterol, may form areas with higher lipidic density. 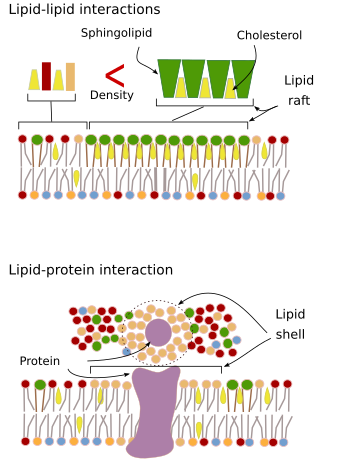 Interactions between lipids and proteins may also generate distinct areas or shells around proteins. Sphingolipids and cholesterol may become associated spontaneously between each other, reducing their motility and increasing the molecular density when compared to neighbor areas. A small distinct group of molecules is formed like a raft in a sea of lipids. Actually, these molecular associations are known as lipid rafts, and are thought to be very abundant and in cell membranes. Lipid rafts show a highly dynamic behavior, they can move, grow, diminish, appear and disappear. Indeed, membranes are made up of many dense domains traveling laterally among the glycerophospholipids, so that membranes are quite heterogeneous regarding their molecular distribution. Some experiments suggest that certain types of proteins "feel" more comfortable inside lipid rafts. These proteins spend more time inside than outside the lipid rafts, thus they travel for some time inside these densities. This causes a segregation of molecules along the membrane, and increases the probability of different molecules to be close to each other more time than just by chance (diffusion), increasing in this way the probability of certain molecular reactions. Furthermore, it is suggested that a high concentration of certain types of lipids in the lipid rafts creates a distinct chemical environment that makes easier some chemical reactions or molecular interactions. Lipid rafts have been proposed to be present in the outer monolayer of the plasma membrane because it is in this side where sphingolipids are abundant. 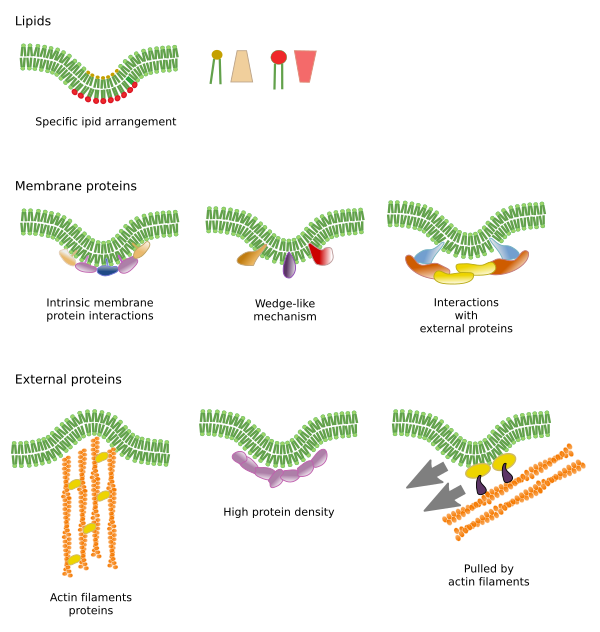 Membrane domains have been suggested existing also in the membranes of organelles, and it is thought that some of their functions rely on these membrane domains. In the inner monolayer of the plasma membrane, microdomains are formed by electrostatic interactions between basic cytosolic domains or divalent cation domains of proteins and the negative polar heads of lipids. Another less known example is the association between phosphatidylinositol bisphosphate and cholesterol that forms microdomains in this monolayer. These microdomains facing the cytosol may influence intracellular protein scaffolds. Traditionally, it has been thought that there are no interactions between both monolayers of membranes and that they distribute their microdomains independently. However, evidences suggest that there are interactions between each other. Transmembrane proteins simultaneously affect both monoloyers since they cross the entire membrane. Other way of synchronization between both monolayers may mediated by the long fatty acid chains, like some sphingolipis that can be 24 carbons in length (the normal length is 18). These long chains may be inserted among the fatty acid chains of the lipids of the other monolayer and influencing the lipidic distribution. Furthermore, lipid domains with long fatty acid chains are thought to be counterbalanced by short fatty acid chain lipid microdomains in the other monolayer, keeping constant the thickness of the membrane. Membrane proteins, both integral and associated, may also interact between each other and assemble into macromolecular scaffolds to facilitate transmission of information, cell-cell recognition, start some enzymatic activities, and cellular movement. There are also multimeric proteins active only when all the subunits are hold together. For example, the insulin receptor is made up of four subunits. Proteins and lipids may also interact to form membrane domains. For instance, in the inner monolayer, phosphatidylinositol associate around proteins by electrical interactions, that can be regulated modifying the phosphates of the polar head of the lipids. Figura 5. Lateral movements of molecules by diffusion may be restricted by interactions with extracellular matrix and cytoskeleton, although membrane local densities such as lipid rafts may affect as well. The organization of the cytoskeleton underneath the membrane restricts the membrane area where molecules can diffuse (image on the right). Integral membrane proteins may also have lateral movements, but they are more restricted than lipids, mostly due to interactions with the extracellular matrix and cytoskeleton through their extracellular and intracellular domains, respectively (Figure 5). These interactions may keep proteins in small areas of the membrane during more time than just by diffusion. Cytoskeleton may form fences just below the plasma membrane that keep proteins restricted in small areas. Actin filaments and microtubules may enclose small areas constraining the difusion of proteins and lipids. Interactions with the cytoskeleton are important because if the cytoskeleton is experimentally disorganized membrane becomes mauch more homogeneous. Cells have other mechanisms to confine proteins to specific domains. For example, gut epithelial cells have some transporters and enzymes located in the apical plasma membrane, but not in the baso-lateral domain because of a belt of tight junctions, a molecular zipper that prevent the diffusion between the apical and baso-lateral domains. Such asymmetrical distribution is essential for the physiology of the epithelial cell. Membrane bending is another way to create microdomains. A membrane curvature may be the starting point to form a vesicle, a cytoplasm extension for cellular expanding, a shape change or growing of an organelle, or just to start a barrier for restricting the lateral movement of molecules. This is a physical restriction by the 3D disposition of the lipids in the smaller angle of the membrane fold. The molecular tools needed for bending a membrane are recruited to specific regions of the membrane. These microdomains may have specific lipid composition or a particular electric charge environment. Phosphoinositides (PIPs), mostly the PIP2 and PIP3, are lipids that contribute to the recruitment of proteins for bending the membrane. They are useful molecules because the electrical charge and molecular structure of their polar heads can be easily modified by chemical reactions. In this way, the properties of a particular membrane region may change when needed and recruit specific proteins. Phosphatidylserine is also able to initiate a microdomain for membrane bending when it is translocated from one monolayer to the other by flipasases. Lipid microdomains recruit proteins that effectively bend the membrane. There are specialized proteins in this role (Figure 6). BAR-domain proteins (Bin/amphyphysin/Rsv161) are one of them. Bending may be induced by two mechanisms: assembling of a curved scaffold of proteins that pull or push the membrane, and by inserting amino acid sequences among the lipids as a wedge. For example, caveolins cause membrane curvature to form caveloae, tetraspain force membranes to form tubules, ESCRT helps with vesicle formation inside endosomes to form multivesicular bodies. Actin is a strong membrane bending agent by actin filament polymerization that pushes the plasma membrane outward leading to cell expansions. Many proteins that can curve the plasma membrane also activate actin polymerization. Figure 6. Membrane bending by molecular mechanisms. There are other domains in membranes, physical domains, formed by molecules like transmembrane proteins. These areas show different membrane thickness because they contain proteins with longer hydrophobic amino acid sequences that get surrounded by lipids with longer fatty acid chains (Figure 7). These proteins and lipids "feel" more comfortable when they are together since they fit properly their hydrophobic parts. They form membrane domains that exclude other molecules, either proteins or lipids, with shorter hydrophobic regions. Figure 7. Longer hydrophobic amino acid sequences of some proteins forms membrane domain with higher thickness. Honigmann A, Pralle A. (2016). 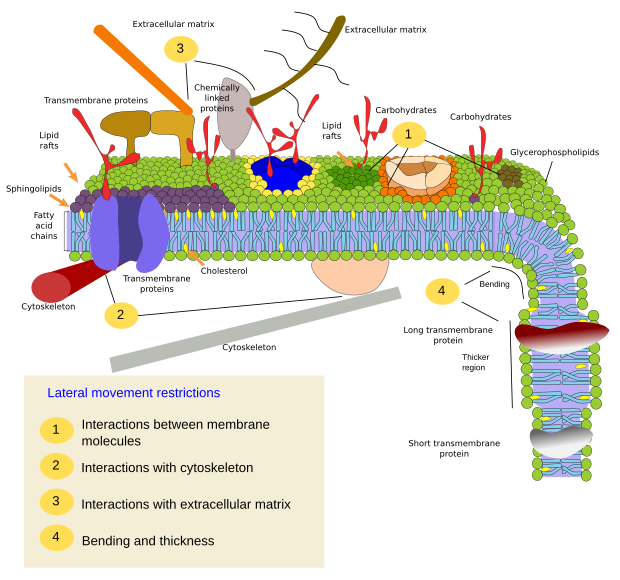 Compartmentalization of the cell membrane. Journal of mollecular biology. 428: 4739-4748. Jarsch IK, Daste F, Gallop JL (2014). Membrane curvature in cell biology: an integration of molecular mechanisms. Journal of cell biology. 214: 275-387. Subczynski WK, Pasenkiewicz-Gierula M, Widomska J, Mainali L, Raguz M (2017). High cholesterol/low cholesterol: effects in biological membranes: a review Cell biochemstry and biohysic. https://doi.org/10.1007/s12013-017-0792-7.